Dairy farmer Chris Marsh farms with his parents, Dennis and Angela at Pincots Farm, near Wotton-under-Edge in Gloucestershire where they own and rent a total of 293 acres. They moved to the farm 13 years ago, bringing with them a herd of 60 cows which has subsequently grown to 130, calving all year round. With two new robots milking their 130 cows, and a third due to be installed early next year, the Marsh family from Gloucestershire has broken free from the monotony of twice daily milking, and at the same time seen an improvement in milk yields. 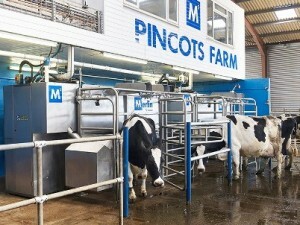 Pincots Farm predominately produce milk for Cadburys dairy milk. The electric contracts they had in place had auto rolled over, not once but twice. Due to the nature of dairy farming, working hours are not ‘standard’ so when they wanted to deal with contracts, usually late at night, no one was available to speak too. When Liz Jenkins met them in 2010 Dennis and Angela were continually having arguments with their suppliers regarding the rates they were paying. Liz was able to speak to them and meet them out of hours when a time was suitable for them. Energy-Procurement took the hassle away from them by liaising with their current suppliers and new suppliers to find them not only the best rates in the market but also to make sure they were on the correct rated meters, and set up the billing correctly with correct estimated usage per meter. Being dairy farmers milking happens at peak and off peak times. Some of their meters were only single rated, we have since upgraded meters to night, day and 3 phase. Energy Procurement then manage all contracts until their expiry when they will be re-quoted with the best possible rates. Full management of the utility procurement alleviates the risk of any high rates being applied to lapse or ‘Auto Rollover’ contracts. Energy Procurement’s Liz Jenkins will continue to work closely with Pincots Farm to ensure they are compliant on their new contracts and ensure they continue to receive the best rates and service they possibly can. Liz is also currently working on renewable projects for the farm to help further reduce their costs in the future.